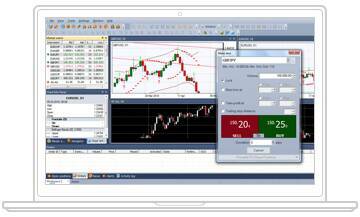 Trading-analytical terminal NetTradeX was developed by NetTradeX Corp. (the member of IFCM Group) in 2006. This is a software product for a trader and a part of the NetTradeX trading platform. The terminal has a complete set of features for trading on the Forex market and excellent opportunities for technical analysis. Trading opportunities of the NetTradeX terminal exceed the range of the most popular trading terminals. The trading software allows the trader to place Trailing-Stop order with server-side execution (the client's terminal can be turned off). The trader can also use the following trading orders: Pending, OCO, Activated, Stop Loss, Take Profit. Trading Orders are executed instantaneously and the availability of tick timeframe allows to obtain the chart of the most minor price fluctuations. The interface of NetTradeX terminal makes the use of its features very simple and intuitive both in Forex and CFD trading markets.Advanced capabilities for managing the working space allow creating chart templates and save the grouped sets of panels and charts. This makes it possible to personalize the workspace of a trader making it as convenient as possible for trading.For traders' convenience the developers of the trading platform, besides price viewing mechanism, timely news update from financial markets, a detailed viewing of account history and balance operations. Due to its design for both Forex and CFD trading the platform has gained much popularity among traders, as they do not have to open accounts in different platforms – they simply have access to all instruments in one terminal.Main features of NetTradeX terminal for ОС Windows may be found in NetTradeX Windows user guide. Go to control panel, find "Remove Programs", enter it, find the program, select it in the list and click "Uninstall".